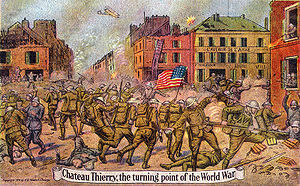 The Battle of Château-Thierry was fought on July 18, 1918 and was one of the first actions the American Expeditionary Force (AEF) under General John J. "Black Jack" Pershing. It was a battle in World War I as part of the Second Battle of the Marne, initially prompted by a German offensive launched on July 15 against the newest troops on the front, the AEF (American Expeditionary Force). American forces first saw serious action during the summer of 1918, contributing eight large divisions, alongside 24 French ones, at the Second Battle of the Marne. Along with the Fourth Army's victory at Amiens, the Franco-American victory at the Second Battle of the Marne marked the turning point of the war on the Western Front. In August 1918 the U.S. First Army had been formed, first under Pershing's direct command and then by Hunter Liggett, when the U.S. Second Army under Robert Bullard was created. After a quick victory at Saint-Mihiel, east of Verdun, some of the more bullish AEF commanders had hoped to push on eastwards to Metz, but this did not fit in with the plans of the Allied Supreme Commander, Marshal Foch, for three simultaneous offensives into the "bulge" of the Western Front (the other two being the Fourth Army's breach of the Hindenburg Line and an Anglo-Belgian offensive, led by Plumer's Second Army, in Flanders). Instead, the AEF was required to redeploy and, aided by French tanks, launched a major offensive northwards in very difficult terrain at Meuse-Argonne. Initially enjoying numerical odds of eight to one, this offensive eventually engaged 35 or 40 of the 190 or so German divisions on the Western Front, although to put this in perspective, around half the German divisions were engaged on the British Expeditionary Force (BEF) sector at the time.